It's no secret that my favourite online shop is iHerb. They sell a huge range of health foods, beauty products, supplements and more. 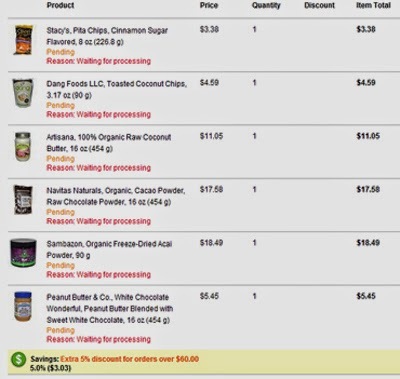 My most common purchases are: roasted coconut chips, cinnamon sugar pita chips, white chocolate wonderful peanut butter (a must for pb lovers), and quest bars. In today's order I have a few new things to try out, so I'm looking forward to getting them - I'll be blogging about them here! At the moment it seems they are having a 5% discount on all orders over $60 which is good. You can also get an extra 5% or 10% discount off your first order by clicking here. Shipping is pretty good too, people have mixed reviews with the delivery times but I never pay much more than $8 per order and usually get it within a week (I have had a couple of orders which took 2 weeks, but it doesn't seem like that is very common). Word of warning...you will find most of your wage going on this website after your first order!